The “Gifotomat” is a GIF format generator that produces double portaits. Inspired by the photo cabin idea, the Gifotomat captures a photo of the person sitting in the cabin and combines the taken photo with an already existing picture originating from a database of reproduced famous paintings. Once the photo of the person in the cabin has been taken, an algorithm is activated that extracts a pertinent selection of portraits from the already existing picture database. This selection is based on the closest match determined by the distance between the eyes of both subjects on the portraits. Once this step has been completed, both portraits are superimposed by aligning the pupils and displaying these alternately in a 0.1 second time interval. The animated loop effect resembles a thaumatrop that employs the phenomenon of “retina persistance” . 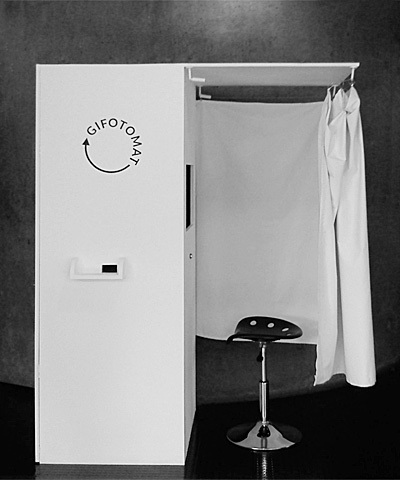 The animated gifs generated by the “Gifotomat” are automatically published on this website. A project created by Caroline Lollo as the practical part of her diploma thesis at École nationale supérieure Louis-Lumière.